Let’s redefine power delivery technology. Together. Spigen is a leading case maker and provider of premier mobile accessories since 2008. Spigen aims to bring innovative products integrating the latest technologies in smart design with durable drop defense. Best known for Air Cushion Technology, Spigen continues to win an unbeatable reputation and longstanding commitment with millions its Team Spigen global community. Founded in April 1993, BOE Technology Group Co., Ltd., is a world leader in semiconductor display industry, as well as an IoT company providing intelligent interface products and professional services for information interaction and human health. BOE’s three core businesses are Display and Sensor Devices, Smart Systems and Healthcare Services. BOE’s display and sensor products are widely used in a broad spectrum of applications such as mobile phone, tablet, notebook, monitor, TV, vehicle display, digital information display, healthcare, finance, and wearable devices. Data from IHS shows that, BOE’s global market share of TFT-LCD panels ranked No. 1 for mobile phone, tablet, notebook, monitor and TV in 2018 Q1. Smart systems provide IoT integrated solutions for various industries such as new retail, transportation, finance, education, art, etc. Healthcare services combine medicine and life science, and is committed to developing mobile healthcare, digital hospitals, regenerative medicine and integrating BOE healthcare park resources. Molex (a subsidiary of Koch Industries) is a globally recognized provider of electronic solutions in a wide range of industries, including data communications, consumer electronics, industrial, automotive, commercial vehicle and medical. Over 17,000 stores and 160 million electronic shelf labels are running on SES-imagotag’s solution in more than 60 countries. Displaydata is the leader in the design and supply of fully graphic electronic shelf labels (ESLs). They were first to market with three-color ESLs and continue to lead this category, having shipped millions of labels. They work in close partnership with many of the world’s largest retail brands and have operations in the US, Europe, LATAM, and Asia. They help retailers optimise revenues and margins by improving the customer experience at the shelf edge, where most purchasing decisions are made. Displaydata’s ESLs enable retailers to control and drive in-store pricing and promotions with speed, agility, and consistency. Their ESLs are part of an architecture designed in partnership with retailers to be enterprise ready. The trusted platform is simple to install and needs the least amount of in-store hardware of any vendor. The wireless network is secure and the robust software enables the centralized management of any number of ESLs, across any number of stores. Xirgo Technologies, LLC., is a leading provider of innovative, full-featured, application-specific wireless IoT communication devices. With comprehensive in-house engineering capabilities in all key development disciplines, Xirgo offers an expansive product line that facilitates best-in-class solutions for numerous vertical market applications. Xirgo is headquartered in Camarillo, California. Being a part of the Samvardhana Motherson Group, Motherson Innovations is a full service industry expert serving market segments including automotive, medical, white goods, consumer goods and clean-tech. The company is driven by researching and networking with leading industry partners, sharing best technologies and process solutions in all areas. The objective is to enable the Samvardhana Motherson Group entering new and attractive market segments with innovative products, and to provide the business divisions with a range of cutting edge technologies for their new products. Motherson Innovations and Ossia inked a deal to establish a joint venture, Motherson-Ossia in January 2018. 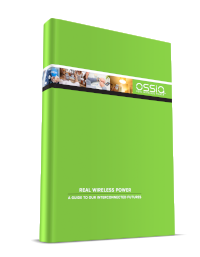 The remit of Motherson-Ossia is to bring Cota Real Wireless Power into vehicles globally.